The Pensacola State College Guitar Association will present Tengyue Zhang, grand prize winner of the 2017 Guitar Foundation of America’s International Concert Artist Competition, in concert on Friday, April 12. The concert is set for 7:30 p.m. in Ashmore Auditorium, Building 8, on the Pensacola campus at 1000 College Blvd. Zhang also will hold a free guitar master class at 3:30 p.m. Thursday, April 11, in Ashmore Auditorium, Room 857. The class is open to the public. Along with his GFA championship, Zhang received first prize in Austria’s Forum Gitarre Wien International Youth Competition, the Changsha International Guitar Competition, the 2017 Schadt String Competition and the 2017 Alexander Frauchi International Competition in Moscow. 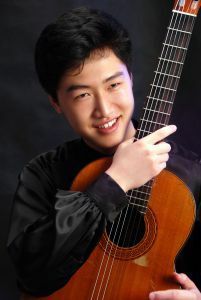 Born in Hebei, China, Zhang began to study classical guitar at age 5 with his father. At age 7, he studied at the Central Conservatory of Music in Beijing. In 2012, he was accepted into The Juilliard School undergraduate program, where he earned a Bachelor of Music in 2016, and Master of Music in 2018. Originally scheduled for September, tickets purchased for the Sept. 22 performances will be honored. Ticketholders who purchased seats for the noon Sept. 20 concert should call 850-484-1847 for reseating. Tickets are $11, adults; $9, seniors, children, non-PSC students and children; $7 for PSC Seniors Club members, PSC Alumni Association members, and PSC faculty and staff. Admission is free for PSC students with current ID. Purchase tickets online at www.pensacolastate.edu/mt or at the Lyceum Box Office, Building 8, Room 861, from 8:30 a.m.-4 p.m. Monday through Friday.